Rangarajan ("Raghu") Sundaram is the Dean of New York University's Leonard N. Stern School of Business. He assumed the Deanship in January 2018. 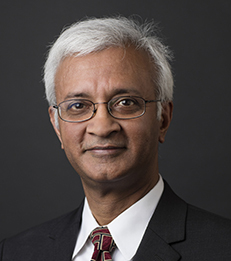 Sundaram, who joined Stern’s faculty a little more than two decades ago, is the Edward I. Altman Professor of Credit and Debt Markets and Professor of Finance, and has been Vice Dean of MBA Programs since 2016. He was formerly at the University of Rochester from 1988-96. He received his B.A. in Economics from the University of Madras, India, in 1982; his M.B.A. from the Indian Institute of Management, Ahmedabad, in 1984; and his Ph.D. in Economics from Cornell University in 1988. Vice Dean Raghu Sundaram is interviewed about Stern's new Executive MBA program in Washington, D.C.